This article is sponsored by Heinz and their new range of pasta sauces, but all thoughts and opinions including recipe ideas and meal suggestions are my own. For a quick and easy family weeknight dinner, you really can’t go past this yummy Spaghetti with Cheats Meatballs. This simple yet delicious meal is a favourite in our house, especially as I can cook it and have it on the table within 30 minutes – perfect for when you have three ‘hangry’ kids in the house! I’m all for finding easier way to do things in the kitchen, and this recipe makes a regular appearance in our house as it’s quick to make and best of all the kids all love it! The hard work of making meatballs is practically done already for you, thanks to using your favourite flavour of sausages, as all you need to do is cut off the ends and squeeze the meat out to create your cheats meatballs, then simply add a few other ingredients plus Heinz Tomato and Basil Pasta Sauce and you will have a filling and delicious family meal in no time. When it comes to choosing which sausages to use for this recipe, you can stick with your family favourites, or you may want to try something new too! This recipe will easily serve a family of six, however if you’ve got little one like me, you will certainly have leftovers and thankfully this recipe freezes really well, making it perfect for nights when you don’t feel like cooking! You can find the recipe for this easy Spaghetti and Cheats Meatballs below…. What’s your favourite easy family dinner? This simple Spaghetti and Cheats Meatballs is a favourite in our house, especially as I can cook it and have it on the table within 30 minutes - perfect for when you have three ‘hangry’ kids in the house! In the meantime, add the olive oil to the frying pan and heat over a medium heat. Cut the ends of the sausages and squeeze out the meat (directly into the frying pan) to form little meatballs. Add the grated onion and crushed garlic and cook for 3 minutes or until the onion begins to turn translucent.Add the grated zucchini and cook for a further 3 minutes - tossing the sausage 'meatballs' regularly to ensure they are brown on each side. Reduce the heat slightly and add the Tomato and Basil Pasta Sauce and a pinch of pepper before cooking for a further 3 - 4 minutes or until the sausage meatballs are cooked through. Use a pair of tongs to carefully transfer the cooked pasta directly into the frying pan and gently toss it through the sauce mixture to coat. Divide between serving bowls and serve with parmesan cheese. 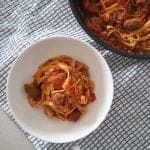 You can also bulk this recipe up to feed more people by adding a couple of extra sausages and cooking an extra 100g of pasta. Love this!!!! Nothing like a quick and easy dinner that everyone will happily eat! !